There is no need for any wrist-slashing by Spurs supporters after the disappointment of yesterday�s defeat at our temporary home of Wembley. The fact is that Tottenham were generally the better side against a Chelsea team that came to stifle the life out of Harry Kane and Co.
As Bill Shankly always used to say: �The League is a marathon, not a sprint.� There is a long, long way to go, and Spurs will rarely have better quality opposition. The honest Tottenham witnesses among us will admit that Chelsea just about deserved their half-time lead, and the football gods were with them through most of the second-half, as confirmed by our guru Paul Smith�s match report HERE. There were long periods when Chelsea were not just parking the bus, but taking the wheels off and putting it up on bricks. Their penalty area was often as packed as Piccadilly in the rush hour. It�s not often you�re going to see Hugo �The Boss� Lloris beaten so easily as by that second goal from Marcos Alonso. And the first by the Spaniard � a humdinger of a free-kick � was just unstoppable. Two myths I would like to see knocked down immediately: 1) that Wembley is a hoodoo ground; 2) that Harry Kane is jinxed not to score in August. We must not let the �Wembley jinx� nonsense take root. It could grow into a psychological barrier if we allow the doom-mongers to keep spreading the fear factor. I am very confident that Tottenham will kick off a winning run at Wembley next Sunday when Burnley are the visitors, and I would not be surprised if Our Harry opens his account for the season, despite the August 27 date. He might easily have already had four goals from the matches against Newcastle and Chelsea, and is looking sharp and hungry. Tottenham�s choir tried hard to make Wembley sound like White Hart Lane yesterday, and certainly do not need any manufactured support from pre-recorded sounds. 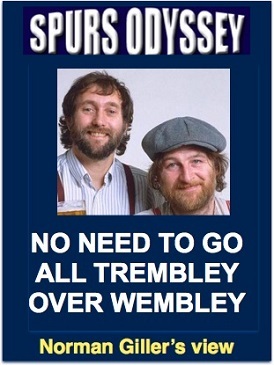 One thing I believe would get near-unanimous support from Spurs fans is to bring back the Chas �n' Dave knees-up music that always gave the Lane a happy atmosphere. Everybody relax. I am confident we will be up there battling for a top four place again, with the two Manchesters and Chelski as the main rivals. The squad has been strengthened by the arrival of central defender Davinson Sanchez, a safety net if contract negotiations with Toby Alderweireld break down. There is also still interest in Everton�s Ross Barkley and/or Barcelona's Sergi Roberto. So put away the razor blades, folks. It�s going to be a long, long season. WEEK 2 of the Sports Odyssey Quiz League 2017-18. The rules are simple: I ask one Tottenham-related question for which a right answer earns you two points, and then a related teaser that can bring you an extra point. All the usual suspects took part last week and there are more than 20 newcomers joining us in this fourth year of the Quiz. Surprise, surprise, you all got question No 1 right (Dave Mackay, who famously and majestically filled the No 6 shirt), and so there are dozens of you sharing top place in the table. The winner this season will get a framed certificate proclaiming him (or her) the Spurs Odyssey Quiz King, plus a no-longer-in-print autographed GOALS book by Spurs idol Jimmy Greaves and another collectors� item from my Greavsie collection: Football�s Greatest Entertainers, signed by Jimmy and Tottenham�s Mr Loyalty, Steve Perryman. I lunched with wheelchair-enabled Jimmy and his devoted son Danny last week, and I passed on the love of all Spurs supporters. Jimmy and his loving family are grateful for all the good wishes coming their way and, although not able to communicate in the way he would like, Greavsie appreciates the thoughts. Who has had Louis van Gaal and Martin Jol as his manager, and has scored five goals in 62 international appearances? Against which team did he score in his Spurs debut in 2012? That was the system I used for ten years in my role as The Judge on The Sun, and before that in my weekly Sports Forum quiz on the Daily Express, and if you can remember that you must be ancient. Then along came Google, and knocked me out of the quiz business. Now I test you with Spurs questions until the last few weeks of the season, when I introduce the dreaded tiebreaker teasers that call for your opinion as much as your knowledge. That�s when I fall out with good friends. In the final count I am the sole judge, and you just have to accept that I am right. Yes, I am out of the Jose Mourinho school of arrogance. First name drawn from the correct answers for SOQL week No 1 was John Carr, of Sidcup. who has followed Spurs since the 1967 FA Cup victory over Chelsea. I will send John a screen version of my Spurs �67 book (you might consider buying a signed hardback copy from me at http://www.normangillerbooks.com � all profits to the Tottenham Tribute Trust to help our old heroes).